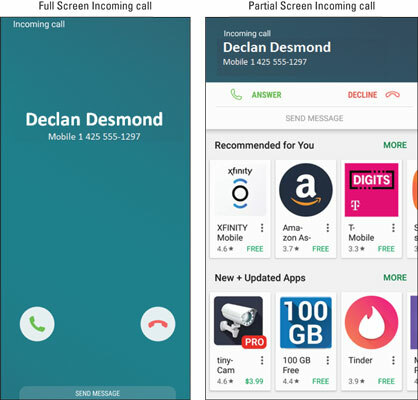 Possible screens when you’re receiving a call. If you aren’t doing anything with the phone at that moment, it will present you with the full screen. If you’re using an app, it will give you a pop-up screen, as shown in the image on the right. To answer the call, tap or slide the green phone button. To not answer a call, you can simply ignore the ringing, or you can tap or slide the red phone button. The ringing stops immediately, and in either case, the call goes to voicemail. Regardless of what you were doing on the phone at that moment — such as listening to music or playing a game — the answer pop-up screen can appear. Any active application, including music or video, is suspended until the call is over. For callers to leave you messages, you must set up your voicemail. If you haven’t yet set up your voicemail, the caller will hear a recorded message saying that your voicemail account isn’t yet set up. Some cellular carriers can set up voicemail for you when you activate the account and get the phone; others require you to set up voicemail on your own. Ask how voicemail works at your carrier store or look for instructions in the manual included with your phone. The answer and reject icons are pretty standard on any cellular phone. However, your Galaxy S8 is no standard phone. There is a third option, and what happens depends on your individual phone. In addition to the standard options of answer or reject, you have one more option — to reject and send the caller a text message. As your caller is sent to your voicemail, you also can immediately send the caller a text message that acknowledges the call. Sorry, I’m busy. Call back later. I’m at the movie theater. You tap the message that applies. The message is sent as a text right away, which alerts the caller that you’re not ignoring him — it’s just that you can’t talk right now. Nice touch. You can also create and store your own message, like “Go away and leave me alone,” or “Whatever I am doing is more important than talking to you.” You could also be polite. To create your own canned message, tap Compose new message and type away. It’s then stored on your phone for when you need it. The caller has to be able to receive text messages on the phone used to make the call. This feature doesn’t work if your caller is calling from a landline or a cellphone that can’t receive texts.